Stocks surged Monday after Wall Street got its early Christmas present -- a bill that would cut taxes for many businesses and that could be signed by President Trump before the holiday. The Dow climbed more than 200 points in early trading, or about 1%, and was above 24,850, a record high. The Dow is up more than 25% in 2017, led by blue chips Boeing (BA), Caterpillar (CAT), Apple (AAPL), Visa (V), McDonald's (MCD) and Walmart (WMT). All those stocks have soared at least 40%. And the Nasdaq, home to hot tech stocks like Facebook (FB), Amazon (AMZN), Netflix (NFLX) and Google (GOOGL) owner Alphabet, topped 7,000 on Monday for the first time. It is up 30% this year. The S&P 500 also rose by about 1% and hit an all-time high. All three indexes closed at records on Friday in anticipation of the release of the tax bill by Republican congressional leaders. The biggest boost for Corporate America would be the slashing of the corporate tax rate from 35% to 21%. That could boost profits significantly for big banks, according to a report from Goldman Sachs. Financial stocks, unsurprisingly, were among the biggest gainers Monday. JPMorgan Chase (JPM), Citigroup (C), Bank of America (BAC) and Wells Fargo (WFC) each rose more than 1% shortly after the opening bell. Businesses would also be charged a one-time low tax rate on foreign profits of 15%. That's an incentive for multinational firms to bring back cash sitting in lower-tax countries. The hope is that this cash will be used to boost dividends and stock buybacks, build new plants in the United States and hire more workers. 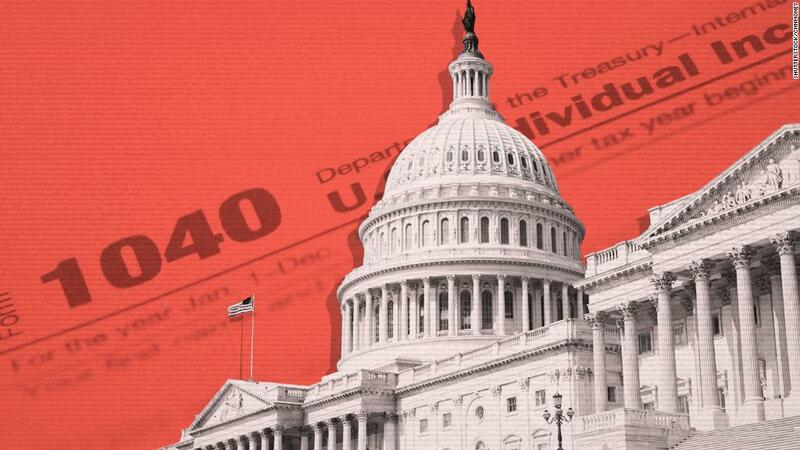 The House is expected to vote on the tax bill Tuesday, and the Senate is expected to vote either Tuesday after the House or Wednesday. The bill is expected to pass on party lines. Stocks have been rallying all year because of strong economic growth and hopes that President Trump would roll back regulations to help stimulate the economy. Even though Trump's effort to repeal Obamacare failed in Congress, many investors had remained optimistic that Trump would strike a deal with lawmakers on taxes. And that's one of the main reasons that the Dow is inching closer to the 25,000 milestone, after already having passed the 20,000, 21,000, 22,000, 23,000 and 24,000 levels this year.